Originally from Miami, Florida, I began studying music at age 7 (guitar) and began performing with the music school’s student band soon after. At age 12, I joined the school band and began playing trombone & baritone in the concert and jazz ensembles. In high school I was awarded “Most Promising Musical Senior” by the music department director. I received a scholarship to a special jazz program at Miami-Dade Community College and played in their jazz ensemble voted “#1 Junior College Jazz Ensemble in the U.S. 1985” by the National Association of Jazz Educators. We were featured at the NAJE national convention in Dallas that year and recorded an album entitled “Top Secret”. At the same time I spent the summer on DCI (Drum Corps International) tours with the Suncoast Sound finishing 6th & 7th in the world championship finals in 1983 & 84 respectively. Next, I studied Music Composition (with a principle in Classical Guitar) at Florida State University. While there I studied with Cuban guitar virtuosos Carlos Molina & noted teacher Adam Holtzman. I continued my studies for several years until my freelance playing career became so successful that I left school to play professionally all around Florida. I’ve performed with blues legend Bo Diddley, popular ‘50s groups The Platters & The Coasters, jazz legends Randy Brecker, Red Rodney, Ira Sullivan & Marcus Roberts, pop icons Stephen Stills (Crosby, Stills & Nash) & Bonnie Raitt and more club bands that I could ever count. I also spent 3 years with “The Mighty Big Blues Band” voted one of the top 10 club bands in America 1992 by the New York Times and recording an album entitled “Almost Live & Sometimes in Color”. In 1997 after returning to Florida State to get a Bachelor of Science degree in English Education, I moved to Japan, where I performed professionally with many bands including an extremely popular Tokyo soul band called “Bumpadelic”. In Japan, I primarily worked as a teacher trainer for classes 1 ½ years old to 4 and on up, developing curriculum for their various programs. During this time, I produced/wrote/recorded a series of mostly original children’s songs and two music video collections for the company, ECC Foreign Language Institute (a large English conversation school chain), on which I played all the instruments and did all the vocals myself. I’ve also developed my own guitar curriculum called “Kung Fu Guitar”. This is a unique program based on my decades of experience as a performing musician. It’s fun way for students of any age to learn whatever style of guitar they might be interested playing, while literally earning a “Black Belt” in the not-so-ancient art of guitar. Since moving to Portland in April 2015 I’ve performed with the Portland Wind Symphony, Hillsboro Symphony, Minidoka Swing Band, for Nike at the Olympic trials at U of O, at Wineup On Williams Jazz Night, and countless freelance performances. 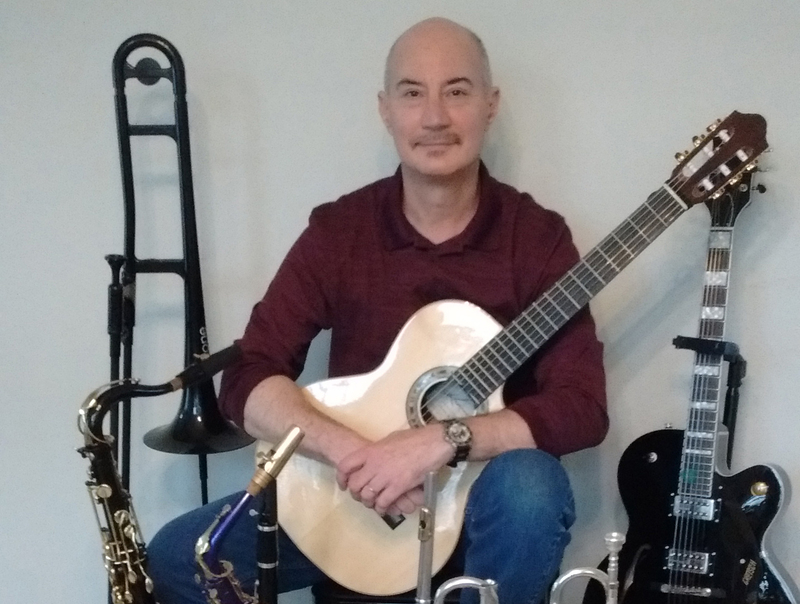 Jeff teaches Pop, Jazz & Classical Guitar, Trumpet, Flute, Saxophone, Trombone, Baritone, Euphonium, & beginning Piano. Jeff is currently accepting new students.